Myfast-search.com is a search tool that will definitely not do anything good for you even though it looks like a good search provider the way it looks. Unfortunately, it will diminish your web searching experience instead of improving it. Therefore, there is no point in keeping such a search tool installed on the computer. Yes, it has an interface of an ordinary search tool, but it is definitely far from being ordinary. As has been found, its only purpose is to promote third-party websites and help the developer earn extra money. In other words, it has definitely not been created to do something good for you, so go to uninstall Myfast-search.com without further consideration. If we have not convinced you yet to do that, read the following paragraphs of this article. If you just seek to find a way to delete Myfast-search.com from all your browsers, you should go to read the last paragraph of this article. It focuses exceptionally on the Myfast-search.com removal. The search tool Myfast-search.com is not considered malicious itself. The main problem is associated with the search results it shows. They are not malicious too, but they might take to untrustworthy websites with infectious contents. In other words, you might land on a website that only seeks to convince users to download and install particular applications. You will not know at first that a website is bad, and when you find out that it is dangerous, it will already be too late. Malware can quickly enter computers, for example, it might already be inside your system after you click on some kind of link you find on the website you are taken to. If you do not go to remove Myfast-search.com right now, this browser hijacker might cause you problems related to your privacy too because it might gather information about you and track your activities on the web. Unfortunately, these untrustworthy third-party websites might act the same, so it would be best not to visit any of them. You will no longer see links promoting them only if you delete Myfast-search.com from all your browsers today. Why do I see Myfast-search.com on my browsers? Like other browser hijackers, Myfast-search.com usually comes bundled with free applications that can be downloaded from the web. In some cases users are informed about the installation of additional software and changes it is going to apply; however, most of the time users do not know about that. In other words, Myfast-search.com usually enters computers without permission. Carefully install software in the future and use an automatic tool if you wish to have your PC clean. How can I remove Myfast-search.com? 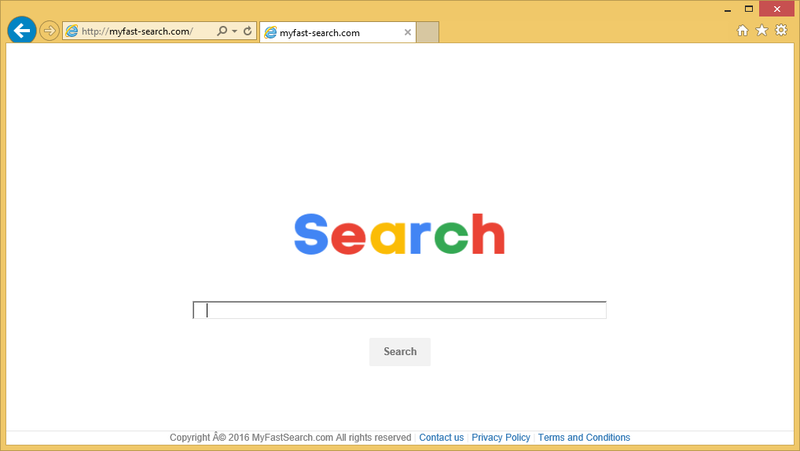 Browser hijackers are not as harmful as other malicious applications spreading these days; however, keeping them installed is not recommended due to problems they might cause, so go to implement the Myfast-search.com removal. The easiest way to get rid of this computer infection is to scan the computer with an automatic tool.